Eight of the 14 candidates running for mayor Feb. 26th participated in last week’s forum, which was organized by the Chicago Westside chapter of the NAACP. All 14 candidates have been invited to the candidates forum, which will be held at 1 p.m. Feb. 9 at Malcolm X College. The forum is sponsored by the Chicago Westside chapter of the NAACP and Austin Coming Together. Know the issues, ask the questions and hear their answers March 5 from 12 to 2 p.m. at Healing Temple Church, 4941 W. Chicago Ave. The Feb. 25 event drew multiple contenders and supporters ready to back their chosen candidates. The forum gave West Side voters an opportunity to learn about contenders whose names will appear on the March 20 ballot. The event gave residents the opportunity to learn more about those running for Cook County positions that will be on the March 20 ballot. Polls will be open Tuesday from 6 a.m. to 7 p.m. 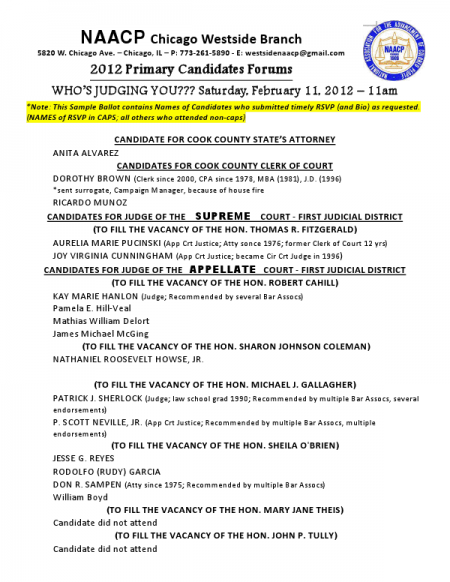 It will be January before West Side residents know who they can vote for in the 28th, 29th and 37th Ward races. A record number of candidate objections has delayed the work of the Chicago Board of Election Commissioners.